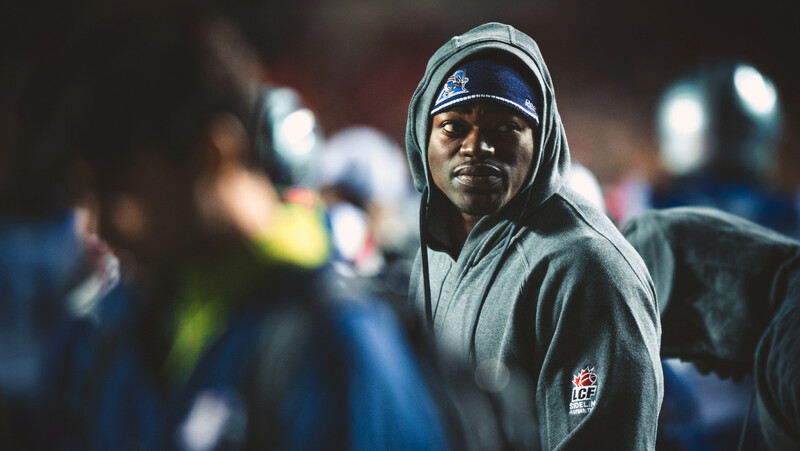 MONTREAL — After a week of trade speculation, the Montreal Alouettes have announced they’ve released 26-year-old national linebacker Henoc Muamba. Muamba, a graduate of St. Francis Xavier, was a highly-touted free agent when he returned from the NFL to join a CFL team last season, eventually deciding on the Als. He recorded 14 tackles and an interception in four games while Montreal failed to make the post-season. The 6-foot, 245-pound tackler is considered one of the best in the business and a ratio-breaker to boot. After being picked first overall by the Bombers in 2011, he broke out in 2012 with 65 tackles, three sacks and five forced fumbles while playing in all 18 games. The following year he took the next step, emerging as an elite linebacker with 106 tackles over 18 games. Muamba was expected to become an integral part of Defensive Coordinator Noel Thorpe’s unit moving forward, but a busy off-season in Montreal led to a change of plans. The Als rebuilt their secondary with the addition of Jovon Johnson and the departures of Jonathan Hefney and Jerald Brown, while the signing of Vaughn Martin provides size in the middle of the defensive line. A native of Congo, Muamba is a ratio-breaker just hitting his prime and is expected to be highly coveted immediately following his release.